I've been playing around with a new web service called Pinterest that bills itself as a place to "organize and share all the beautiful things you find on the web." That sounds suspiciously like a lot of other web services out there, like Delicious, wikis, tumblr, etc. 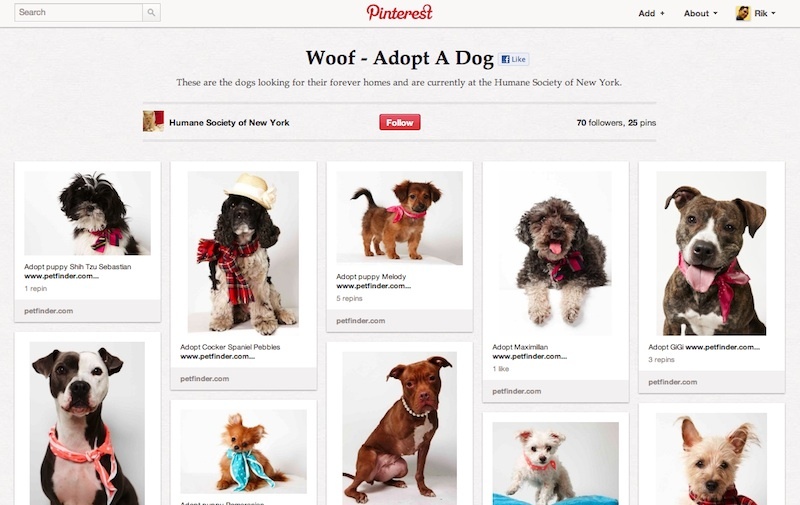 What makes Pinterest stand out is the way it streamlines the process of creating a visually-rich online space. They call their spaces "pinboards" where you can place a collection of images, links, recipes, videos, or virtually anything else that is accessible on the public web. For a design-minded person, it's an aesthetically satisfying experience to surf through other people's pinboards, grab "pins" that interest you, and add them to your own pinboard. In addition, nonprofits are already creating some interesting use cases for everything from collaboration to fundraising and awareness raising. Pinterest provides a clever "pin it" bookmark that you can add to your bookmark toolbar, so that anytime you see something on the web that you want to add to a pinboard, just click the "pin it" bookmark, tell Pinterest what pinboard to add it to, and you're done. You can create pinboards that are your own personal space to drop pins, or you can invite others to collaborate with you on a shared pinboard. 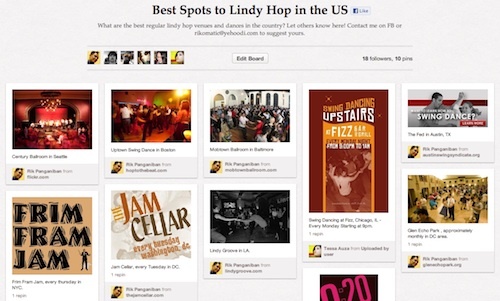 Here for example is a pinboard I created on the "Best Spots to Lindy Hop in the US." People I invite can add their own dance venues, comment on and "like" ones I've added, and grab individual pins to add to their own pinboards. 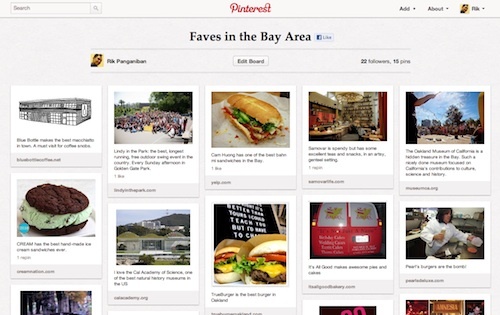 Another one I created is a personal pinboard of my favorite places in the Bay Area. I probably don't want to open this up to others to add to, since this is my personal list. But I can grab pins that others share if I find something interesting for my pinboard. I haven't spent a whole lot of time with Pinterest. But right now I think it seems best for quickly putting together a small collection of image-rich links for a specific purpose. It's quick, fun, and satisfying to throw together a board and grab pins from other people's boards. But I already am getting frustrated with the lack of controls for how your different boards and pins are displayed. I would love to be able to sort pins, move them around, resize them, and group them in different ways. And Pinterest can only grab pins from sites that have a large enough image or video that they can use to create a thumbnail. So a website without adequate images won't be able to be pinned, which I have found for several sites already. Pinterest is slowly rolling out there service to the public. Right now you have to request access to the service. It only took me a day to get my invite. There are some delays in adding pins, so they may need to beef up their servers to handle all of the traffic.